Wes Lunt is heading home. 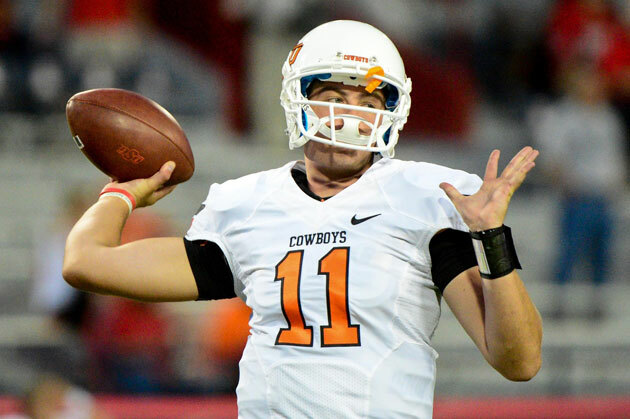 The former Oklahoma State quarterback has chosen to transfer to Illinois, deciding on the Illini over Louisville. Lunt hails from Rochester, a 90-minute drive from Illinois’ campus in Champaign. "I know it's a team game and I can't do it all by myself," Lunt said. "I do hope we can add some more good recruits." Lunt called Illinois coach Tim Beckman on Monday to inform him of his decision. "I am OK with how I left Oklahoma State," Lunt said. "God had a plan for me. No hard feelings with Coach (Mike Gundy)." The hard feelings with Gundy could have potentially sprung from the fact the Cowboys’ head coach put restrictions on Lunt’s potential landing spots last month. Despite Oklahoma State being in the Big 12, Gundy refused to let his freshman quarterback transfer to Vanderbilt and Tennessee, which are in the SEC. He also restricted Lunt from transferring within the conference or to Southern Miss, where former OK State offensive coordinator Todd Monken is now the head coach. Gundy hasn't elaborated on the reasons for the specific restrictions. Lunt won the starting job out of camp last year as a true freshman, replacing Brandon Weeden as the trigger man in Gundy's vaunted offense. He battled injuries all year, which led to a quarterback carousel in Stillwater, featuring Lunt, J.W. Walsh and Clint Chelf. Lunt threw for over a thousand yards (including a 436-yard effort against Arizona) in his six games of action. Walsh, Chelf and transfer Daxx Garman will compete for the job, although Chelf – who started the final five games of the season – was briefly named the starter by Gundy earlier this year. Lunt will have to sit out this fall, per NCAA rules on transferring. This is quite a coup for Beckman, whose team ranked 104th in the nation in pass efficiency during last year’s 2-10 season, his first as head coach in Champaign. (Another of Beckman's previous stops was at Oklahoma State, where he served as defensive coordinator in 2007 and 2008.) Lunt was the seventh-ranked pro-style quarterback coming out of high school and will likely be competing against incoming freshman Aaron Bailey, one of the top dual-threat quarterbacks in the nation, for the starting gig. Although it is unlikely Beckman would find his job in jeopardy after two seasons, it will certainly help his case to be able to point to a bright future under center.